Ammunition, Batteries, and Buildings: The Legacy of Fort Hancock ~ The History Girl! New Jersey's northernmost barrier island has been a host to military action since the American Revolution. Sandy Hook is a narrow spit of land stretching two miles between Lower New York Bay and the Atlantic Ocean. For one hundred years, Fort Hancock at Sandy Hook trained countless men and women, tested weapons, and protected the shore from attack. Today, most of Sandy Hook remains vacant, awaiting new uses as beach-goers and nature enthusiasts enjoy the natural surroundings. These lone buildings and batteries housed generations of Americans and tell a story of the men and women who worked there, protecting New Jersey's coast and New York Harbor from attack. The Dutch called the area "Sant Hoek;" with the English "Hook" deriving from the Dutch "Hoek," meaning "spit of land." Sandy Hook’s location at the entrance to New York Harbor made it an important site for the defense of New York City. Large enemy warships had to navigate the Sandy Hook Channel to attack the harbor, putting them within cannon range of Sandy Hook. The series of forts built on Sandy Hook from Colonial days to the modern missile era represented the latest defense systems in the nation. Each fort used the newest technological improvements in weapons and construction techniques of their time. During the American Revolution there were no fortifications on Sandy Hook, which allowed the British to enter New York Harbor unopposed. The lighthouse at Sandy Hook, constructed in 1764 by a lottery to guide ships into New York Harbor, was evacuated and dismantled at the start of the war. The lantern was taken off-site so that the British would be unable to use it. However, British loyalists quickly reestablished the light station and fortified and guarded the Sandy Hook Lighthouse from attack by American Patriots for most of the Revolution. The Continental soldiers attempted to bombard the lighthouse with cannons, but the thick walls of the lighthouse were not damaged. The light station stands today as America's oldest continually operating lighthouse. During the War of 1812, the British Navy blockaded American harbors including New York. American forces built a wooden fortification named Fort Gates near Sandy Hook’s tip. Although British forces attacked several American cities during the war, they never attacked New York. The War of 1812 demonstrated that the United States needed to defend its maritime ports with permanent and reliable fortifications. In 1859, Army Engineers started building a massive, granite masonry fort at the north end of Sandy Hook. However, before the “Fort at Sandy Hook” could be completed, rifled artillery was introduced. This new technology pulverized brick and granite walled forts, making this type of fortification obsolete. To test new weapons and ordnance, the Sandy Hook Proving Ground was established on August 7, 1874. This was the United States Army's first proving ground. Sandy Hook was an ideal location to test new ordnance because it was located far away from homes and the public. The army could fire weapons offshore without the threat of damage. The Proving Ground continued its operations as a weapons test site until 1919 when the testing was moved to the Aberdeen Proving Ground in Aberdeen, Maryland. The Sandy Hook facility tested every gun that was used by the army, including ordnance and protective armor for every war through World War I. Battery Proof at the Sandy Hook Proving Ground, circa 1900. In 1890, the United States introduced the concrete gun battery, which mounted the most modern and powerful cannons of the day. These gun batteries were designed to blend into the seashore environment for protection and camouflage. Because New York Harbor was America’s most important port, Sandy Hook was chosen as the site for America’s first concrete gun batteries. Here the army constructed its first, and only, steam-powered “lift-gun battery,” Battery Potter. The Battery was completed in 1895. The guns were raised and lowered from within the battery. This procedure made the guns disappear from the enemy’s view, and soldiers started calling them “disappearing guns.” Sandy Hook was also the site of America’s first mortar battery. 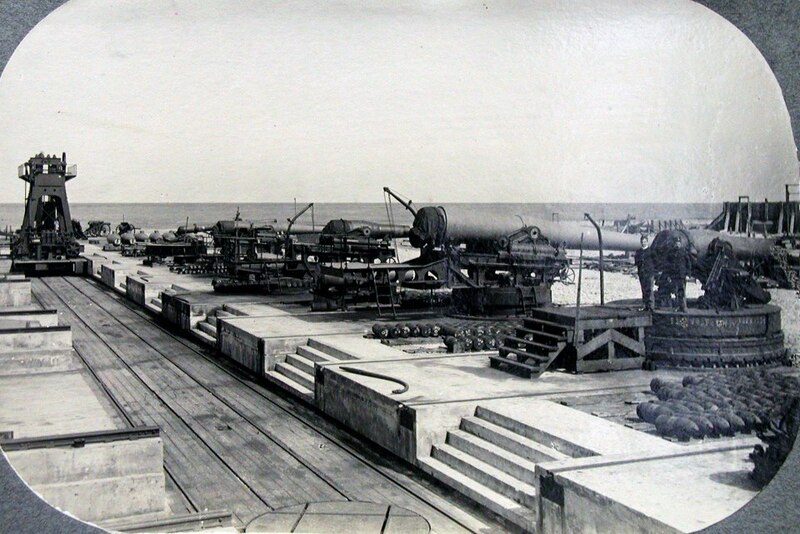 Completed in 1894, Mortar Battery mounted sixteen guns which were divided into four massive concrete and earth covered “firing pits.” The mortars were designed to fire armor-piercing projectiles, weighing up to 1,000 pounds, in high arcs to bombard an approaching enemy battleship or cruiser from above. This was in contrast to previous gun design which fired parallel to the ground, piercing the sides of ships. On October 30, 1895, the War Department designated the fortifications at Sandy Hook, Fort Hancock, in honor of Civil War Major General Winfield Scott Hancock. 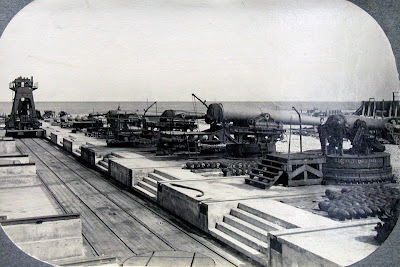 Between 1896 and 1909, seven counterweight-type disappearing gun batteries, Battery Granger and the Nine-gun Battery, were built. By the late 1890s, a plan to house soldiers at Fort Hancock was developed. The fort underwent an expansive building program. The ever handsome yellow brick officer's row, the enlisted men's barracks, and numerous other support buildings such as a bakery, mess halls, fire station, post hospital, and stables were constructed. The hospital burned in 1985. By 1899, thirty-six buildings had been built. By World War II, Fort Hancock had several anti-aircraft gun batteries located at or near its older gun batteries. Batteries Kingman and Mills on the bay side were also modernized during World War II. Their guns were protected from aerial bombing by the addition of thick concrete walls and roofs called casemates. However, increasingly powerful weapons and changing tactics of World War II finally made the concept of defending harbors with heavy artillery obsolete. During World War II, Fort Hancock's population swelled significantly and temporary housing and tents were utilized throughout the complex. By the late 1940s, many temporary buildings were deemed unnecessary and removed by the army. In 1954, the army started replacing anti-aircraft guns with new Nike Air Defense Missiles. The Nike Missile was designed to intercept and destroy fast, high altitude jet warplanes before they reached a metropolitan area. The first type, the Nike Ajax, had a range of thirty miles and a maximum altitude of 60,000 feet. The larger and more advanced Nike Hercules could carry either a conventional or nuclear warhead more than 100 miles at an altitude of over 150,000 feet. The Nike Missile Base at Sandy Hook was named NY-56. The introduction of the Intercontinental Ballistic Missile (ICBM) led to the deactivation of the entire Nike Air Defense system in 1974. Fort Hancock was decommissioned December 31, 1974. Since 1874, Fort Hancock witnessed the ever-changing defense of America. Often times, weaponry changed faster than facilities could be constructed. However, countless men and women served at Sandy Hook, enabling this "city" to operate and protect the United States. Today, the majority of the batteries and buildings sit vacant. Some of the over 100 buildings still standing have been restored, such as the 1898 History House, the Fort Hancock Museum inside of the Post Guardhouse (1899), and the Sandy Hook Lighthouse. A few of the homes on Officer's Row have been leased to non-profit groups while other larger buildings are leased to educational institutions. A few of the other buildings still open to the public and in use include a renovated chapel, homes for the enlisted men and officers now housing National Park Service staff, and the former post movie house which is now used for music and live theater. The interiors of Batteries Potter and Gunnison have also been restored and ranger-led tours are available at various times throughout the year. In stark contrast, Nine Gun Battery, Battery Granger, Battery Kingman, and Battery Mills sit idle, letting nature reclaim them. Sandy Hook and Fort Hancock is a unique site that merges history and nature. As the next century of Fort Hancock's history unfolds, that balance between historic preservation and the natural beauty of the Jersey Shore must be maintained.